Nicholas Conservatory and Gardens on the Rock River in Rockford boasts 11,00o square feet of tropical plants to enjoy. Massive palm trees soar several stories into the air within the glass enclosed building. Nestled among ponds and waterfalls, the greenery to give soothing background sounds. There are plenty of places to sit and take in the sights, allowing your body and mind to relax as you your senses take in everything around you. Whimsical sculptures appear dotted along the winding pathways. Plants stream down from the ceiling, along the walls, from pots and decorative picture frames. 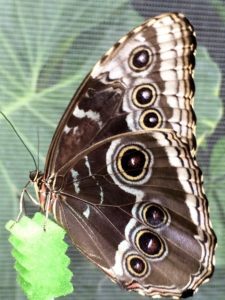 We timed our visit for the butterfly exhibit where dazzling splashes of color flitted about the room and allowed for up close examination. Caterpillars and chrysalis hung in the first room as the prepared to emerge. 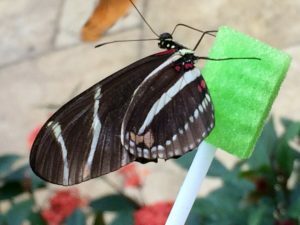 Adult butterflies dried their wings in preparation for their move to the main exhibit area. It was interesting to note each type of caterpillar created a unique chrysalis. Before we entered the main exhibit, we took off our coats to prevent hitchhikers from leaving with us. We entered through a set of double doors to prevent escapees. Once inside, we were handed sponge swabs doused in Gatorade to attract the insects. Every color of the rainbow was represented in the flying collection. 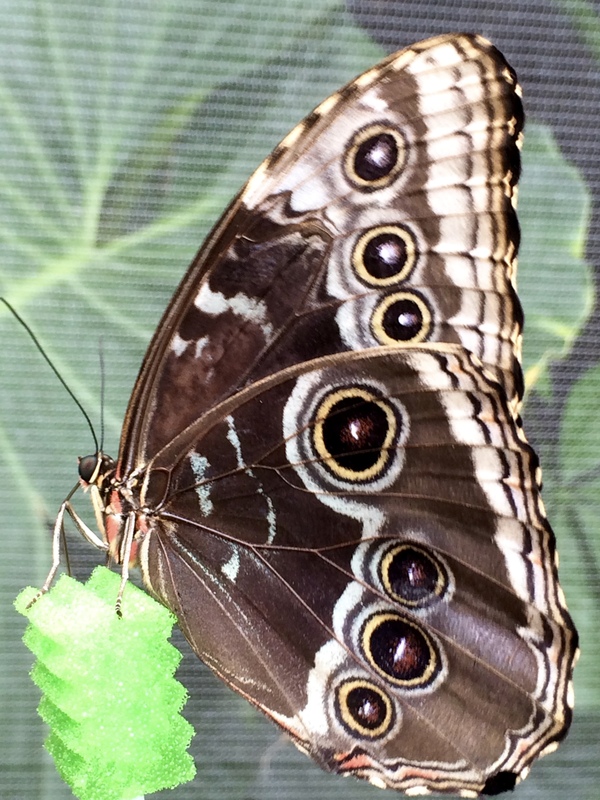 The butterflies perched on greenery or screens allowing visiting to get an up close and personal look at each insect. Outside the conservatory, walk through the colorful gardens near the front entrance, along the side and rear of the building filled with seasonal plantings. A lagoon with two fountains adds to the fun. Statues are perched in various locations along the paths. Bring your lunch and take in the sights from the patio area outside or indoors. The conservatory gift shop offers moderately priced wind chimes, note cards, jewelry and other remembrances of your trip. Toni’s Cafe of Winnebago serves soups, sandwiches and desserts. A variety of classes from photography to yoga are available. Managed by the Rockford Park District, Nicholas Conservatory is open every day except Monday. Entrance fees are reasonable, even more so when you visit on Tropical Tuesdays when entrance fees are only $3.00. After your visit, stroll along the Rock River. There is a paved path popular with walkers and bicyclists. We even found a unique group of statues comprised of rocks, of course, along the Rock River.